Corinne Frottier Sensei was born in 1953 in Brussels, grew up in Austria and came to Germany in 1975. She has been living in Hamburg since 1983, where she started working for the radio in 1985 as an author and director of radio-dramas. In 1989, she met her teacher Catherine Genno Pagès, from whom she received transmission in July 2009. She is Genno Roshi’s third Dharma-heir. In May 2009 she founded „Zen-Sangha GenjoAn e.V.” which is a non-profit association, gathering the members of the Sangha as well as donators, who want to support the Sangha’s activities. Listen to some of her Dharma-Talks here. In October 2016 she publishes her book „So wie Du bist. Der buddhistische Weg zur Selbstannahme” – so far in German only. 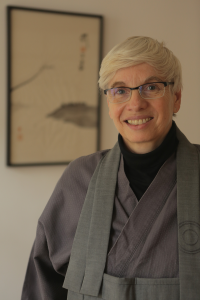 Corinne Frottier Sensei also contributed an essay to the book „Pearls of Ash and Awe“ by Bernie Glassmann Roshi and the Peacemaker Order.